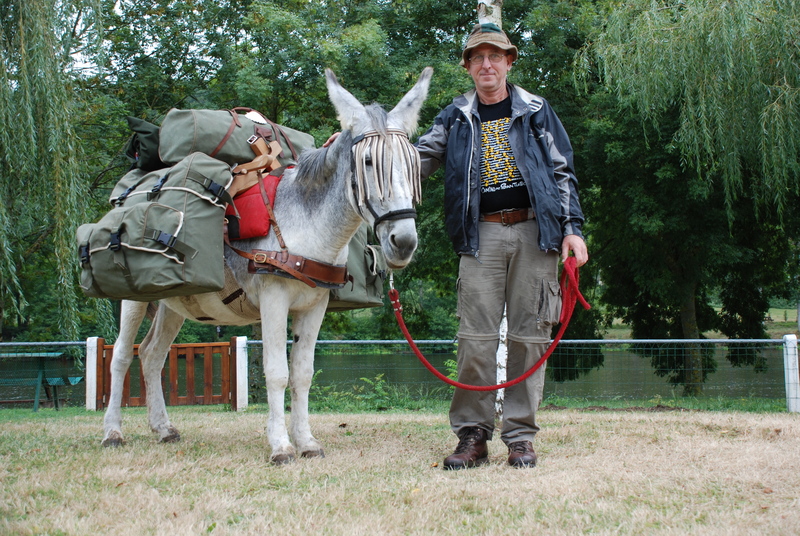 In 2008, two years after the encounter with the donkeys in Conques, I walked from Worcester via London and the Newhaven-Dieppe ferry to Santiago de Compostela. It had been at the back of my mind for a long while to do the classic full-length mediaeval pilgrimage from England to Spain and now I had the opportunity as I was free for three months, prior to starting studies in Rome. I knew I must do it or I would never have the chance again. I also decided t o walk for charity: it seemed fitting to utilise a two thousand kilometre walk to raise awareness and funds for a children’s mobility charity, Whizz-Kidz. I created a blog, and I used my phone to write blog posts all the way from Worcester to Compostela and Finisterre. I enjoyed using this new medium and marvelled at the way it allowed people to share the experience live. It also promoted the fund raising for the charity. It was a very hard walk, but I had arranged with a fellow member of the English pilgrim association, the Confraternity of St James, that I would stop for a full rest at her farm in Antigny, not far from Chauvigny, before continuing south. I had intended to walk as far as Poitiers before taking that break, but a few days before I got there I was caught in such a terrible day of thunderstorms and torrential rain that I phoned from Chatellerault and Barbara Reed drove to rescue me and begin my rest day in Antigny early. 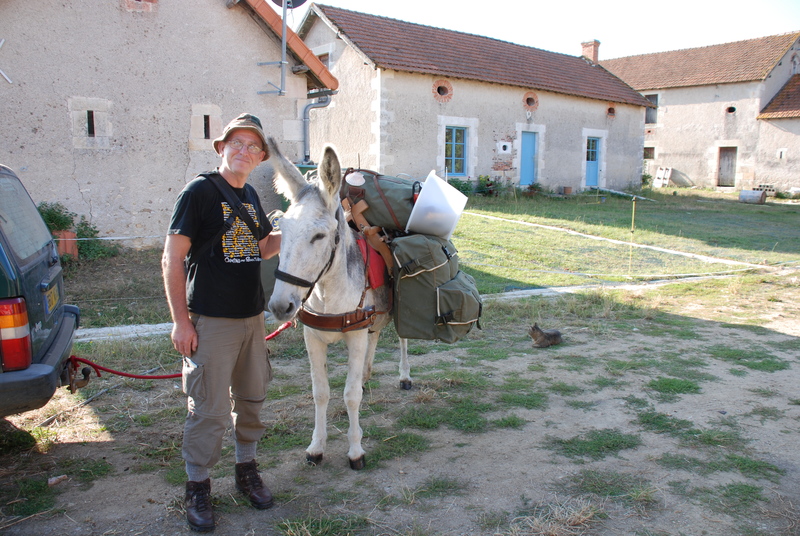 That is how I came to meet pilgrim donkey Dalie, for Barbara was well-known among the pilgrim community for long-distance donkey walking on the Compostela routes of France and Spain. Dalie was probably the only donkey who you could show a pilgrim scallop shell and she would head off to Compostela knowing the way perfectly! She was already getting quite old but still had a few walking years left in her. I stayed for two days – longer than planned – with Barbara and her husband Chris at Antigny, and it was wonderful to get all my wet pilgrim clothes washed and dried, ready for the second half of France. The rain showed no sign of stopping! I found myself drawn time and again to the stable to see the donkeys, groom them and talk to them. 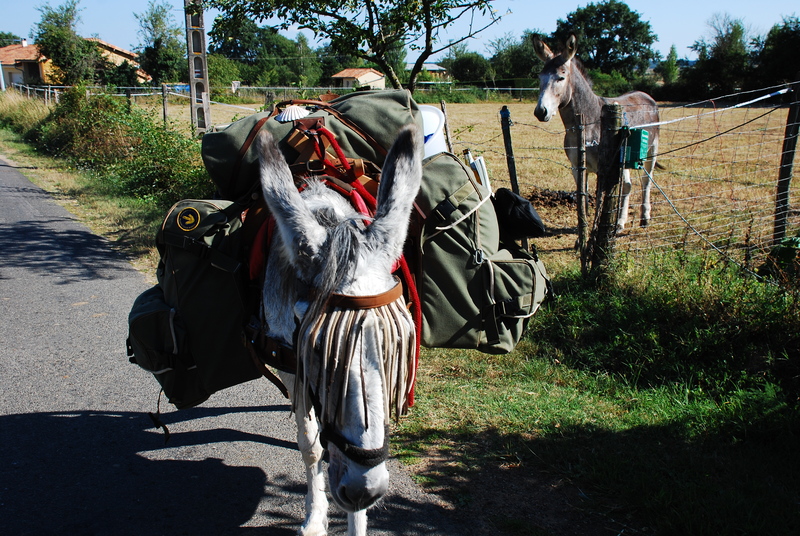 Of course, I remembered the pilgrim donkeys I had seen in Conques two years earlier, and I was pleased to find out a little more from Barbara about the practicalities of keeping donkeys and walking with them. 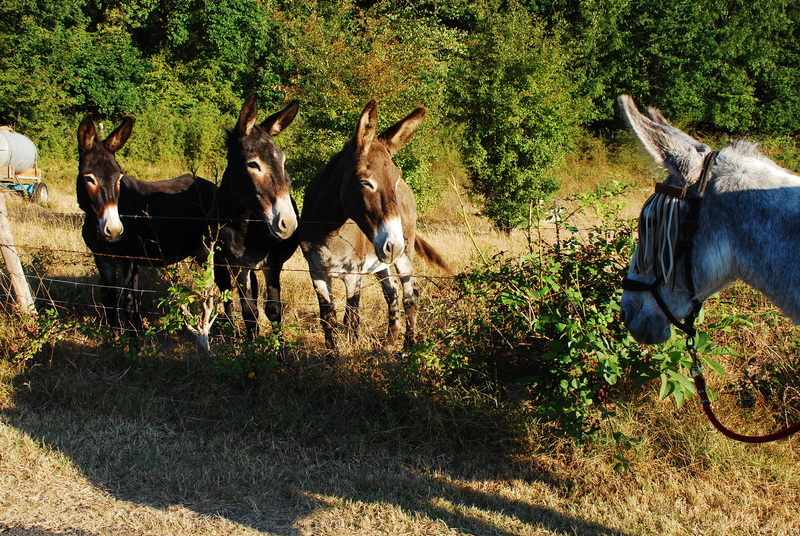 What struck me most during these rest days at Antigny was the way the donkeys seemed to convey such an overwhelming sense of calm and peace. I did not see Barbara and Dalie again for another two years, when I went there to stay in Antigny and help paint the refurbished farm building on a working holiday. At that time I was recovering from a very damaging life event and the peace of the farm was life-giving. The renewed contact with the donkeys was once again a reminder of my gradual sense of intrigue: these animals seemed to have something quite different about them. Apart from having a rather unusual pet Belgian hare when I was a teenager, I had not really been an animal person and didn’t have pets in my adult life. Barbara referred to all her animals as “people”. Dog, cats, chickens, donkeys: they were all the people on the farm. It seemed to strike a resonance with me. 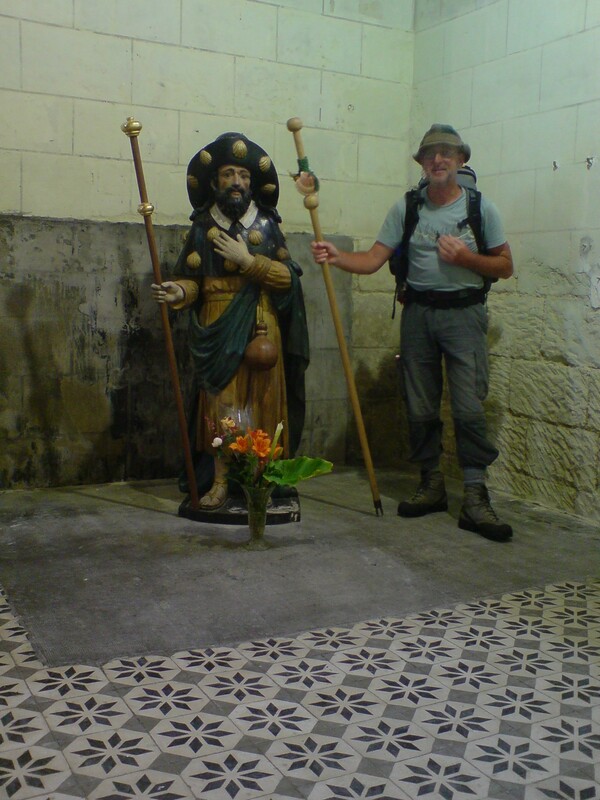 “Why don’t you take Dalie and go walking on the local Compostela route?” suggested Barbara. I had finished the painting of all the new doors and windows in the farmhouse. Also, during the time I was staying at Antigny I had been offered a teaching contract in Spain to start the following month. 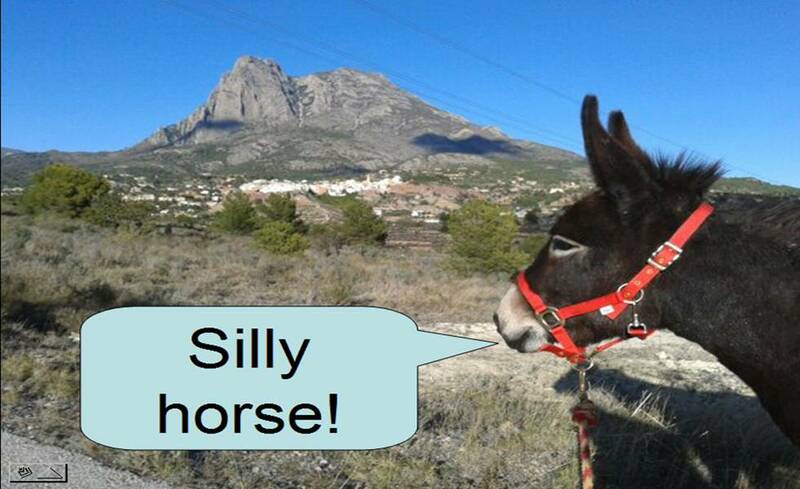 The prospect of taking a pack donkey on a pilgrim route, with no experience of large animals, was appealing but at the same time a little daunting. 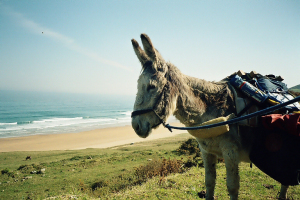 Barbara was very reassuring: Dalie the donkey person would show me the ropes: she knew what walking with pilgrims was all about, even if I knew nothing about donkeys. 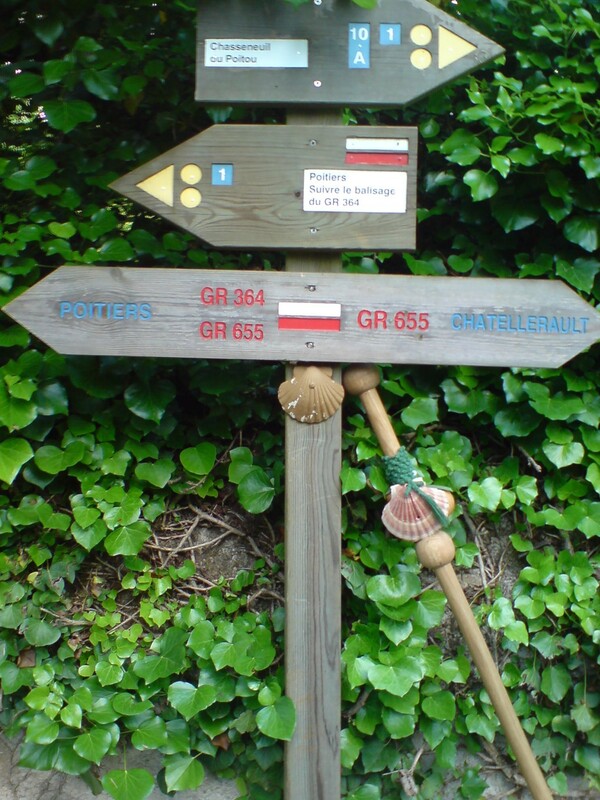 So it was all quickly planned, and a route south along the rivers Gartemps and Vienne was planned, following a Compostela path. It is quite difficult to explain my immediate sense of Dalie’s dutiful work, carrying her 6o kilo load of camping gear and supplies, and the way she instantly offered companionship on the walk. We had bonded by lunchtime on the first day and shared a picnic meal together by the river Gartemps. There was something else that I learned about walking with animals: you get to meet other animals! Not only do donkleys come racing across the field in excitement to meet one of their own, but there are social differences. Dalie walked stright past a very friendly male in a field, without even looking at him, and yet a few kilometres further along the road we came to a whole bunch of donkeys and Dalie would not be led away until she had a proper conversation with them. There was also a remarkable moment when Dalie stopped perfectly still on a forest path, staring intently at something in the shade of a tree in the field next to us. My scent was shielded from the little animal curled up there, by the stronger scent of Dalie. Just four or five feet away from me was a baby deer, just days old: a living Bambi with dapples merging into the dappled shade of the large oak tree under which she sat, curled up, looking quite relaxed at Dalie. Foolishly I reached into the pannier bags to find my camera, and Bambi flew immediately, like a silent arrow across the field. The most moving experience of that walk with Dalie was on the day we reached the river Vienne. It had been hot and I was looking forward to a swim. We found a campsite and they were happy to accept a donkey, so I set up the electric fence compound for Dalie (suitably signposted to warn other campers!) and I gave her the reward for her day’s work: her evening feed. Then I quickly put up the tent and headed into the river for a swim. The water was fast flowing but only a metre deep even in the middle. It was mostly so shallow it was difficult to get wet in it, let alone swim. I found a place where I could duck under the water, revelling in the cold refreshing contrast to the August heat of the 15 kilometre walk we had completed. Suddenly there was a commotion and a most awful noise. People came out of their tents and caravans to see what the fuss was about. Dalie had walked away from her food and was staring out across the river at me, braying her heart out with great hoarse fog-horn alarm calls, and people were looking at her and looking towards me – following the line of her sight – for she believed I was in danger and was calling everyone to help. It was a remarkable moment when I realised how intelligent donkeys are, and also how much Dalie had bonded with her fellow pilgrim after a couple of days on the road together. At the end of our walk, Barbara came to collect us with the horsebox and I left Dalie back in the welcoming company of Rosie, in the stable on Barbara’s farm. I caught the bus from Poitiers to Benidorm (yes, there was a direct bus!) to begin my new teaching post in September. 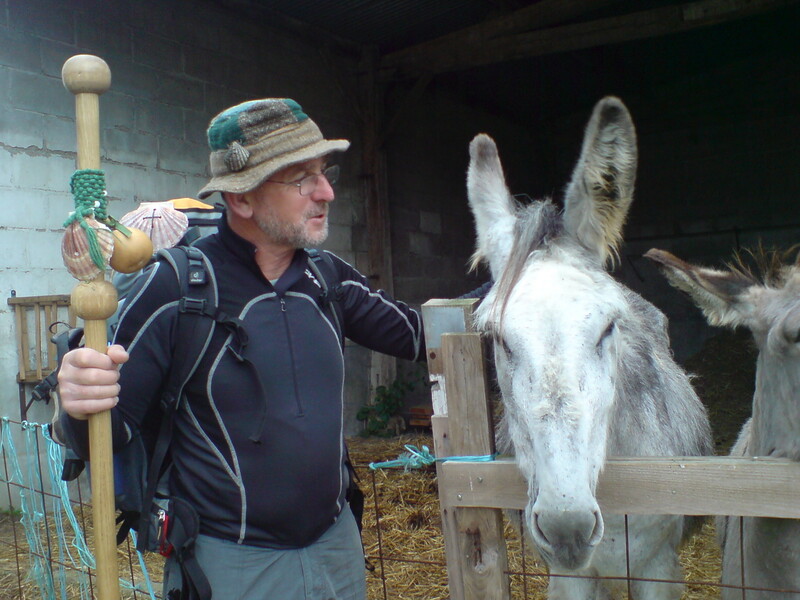 This walk with Dalie was for me the fulfilment of the vision I had in France in 2006 of the pilgrim families walking with donkeys in Conques. “You had the experience but missed the meaning.” The meaning was becoming clearer. 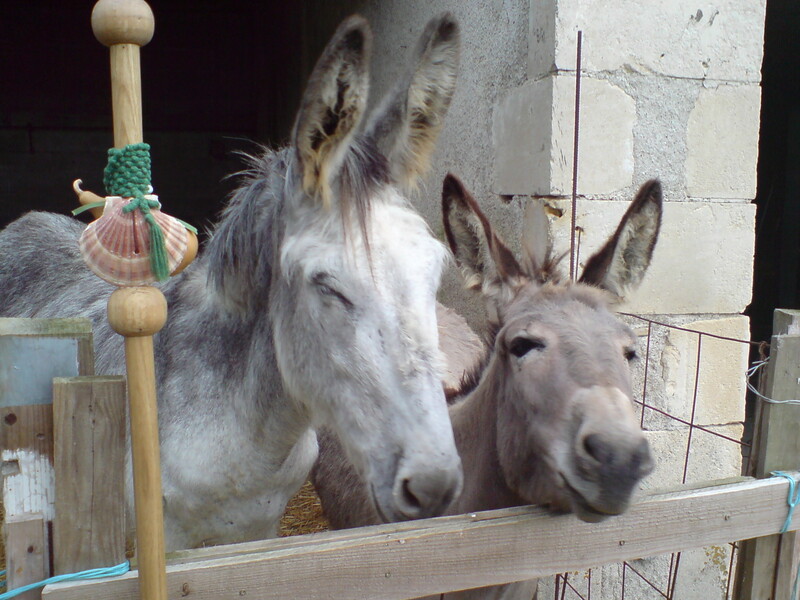 I was heading for a new life in Spain, and it was time to get some donkeys. I have a hard enough time walking with human creatures, let alone those of a different persuasion. It is delightful to learn how deep the rabbit hole goes. Thanks for your comment: Part 3 will appear later today. I think I may have identified the problem: comments on pages in the drop down menu do not appear in the comments sidebar, as do messages on blog posts. What a wonderful account. Thank you and best wishes to you, Alys and your donkeys, whatever happens with Brexit.